Diodorus Siculus was a Greek historian who wrote in the 1st century B.C. According to Diodorus' own work, he was born at Agyrium in Sicily (now called Agira). With one exception, antiquity affords no further information about Diodorus' life other than that which is to be found in his own work, Bibliotheca historica. Only Jerome, in his Chronicon for the year 49 B.C. writes, "Diodorus of Sicily, a writer of Greek history, became illustrious." Diodorus is known for a single work, which he named Bibliotheca historica ("Historical Library"); it consisted of 40 books, of which books 1–5 and 11–20 survive. The history is divided into three sections. The first six books treat the mythic history of the non-Hellenic and Hellenic tribes to the destruction of Troy and are geographical in theme. The standard English translation of Diodorus' work is by Charles Henry Oldfather (1887-1954), Professor of Ancient History at the University of Nebraska; his translation is now in the public domain. ... Since Egypt is the country where mythology places the origin of the gods, where the earliest observations of the stars are said to have been made, and where, furthermore, many noteworthy deeds of great men are recorded, we shall begin our history with the events connected with Egypt. Now the Egyptians have an account like this: When in the beginning the universe came into being, men first came into existence in Egypt, both because of the favourable climate of the land and because of the nature of the Nile. For this stream, since it produces much life and provides a spontaneous supply of food, easily supports whatever living things have been engendered; for both the root of the reed and the lotus, as well as the Egyptian bean and corsaeon, as it is called, and many other similar plants, supply the race of men with nourishment all ready for use. As proof that animal life appeared first of all in their land they would offer the fact that even at the present day the soil of the Thebaid at certain times generates mice in such numbers and of such size as to astonish all who have witnessed the phenomenon; for some of them are fully formed as far as the breast and front feet and are able to move, while the rest of the body is unformed, the clod of earth still retaining its natural character. And from this fact it is manifest that, when the world was first taking shape, the land of Egypt could better than any other have been the place where mankind came into being because of the well-tempered nature of its soil; for even at the present time, while the soil of no other country generates any such things, in it alone certain living creatures may be seen coming into being in a marvellous fashion. In general, he says that if in the flood which occurred in the time of Deucalion most living things were destroyed, it is probable that the inhabitants of southern Egypt survived rather than any others, since their country is rainless for the most part; or if, as some maintain, the destruction of living things was complete and the earth then brought forth again new forms of animals, nevertheless, even on such a supposition the first genesis of living things fittingly attaches to this country. For when the moisture from the abundant rains, which fell among other peoples, was mingled with the intense heat which prevails in Egypt itself, it is reasonable to suppose that the air became very well tempered for the first generation of all living things. 6 Indeed, even in our day during the inundations of Egypt the generation of forms of animal life can clearly be seen taking place in the pools which remain the longest; for, whenever the river has begun to recede and the sun has thoroughly dried the surface of the slime, living animals, he says, take shape, some of them fully formed, but some only half so and still actually united with the very earth. The sun, who sees all things and hears all things. Some say that Osiris is also represented with the cloak of fawn-skin about his shoulders as imitating the sky spangled with the stars. As for Isis, when translated the word means "ancient," the name having been given her because her birth was from everlasting and ancient. And they put horns on her head both because of the appearance which she has to the eye when the moon is crescent-shaped, and because among the Egyptians a cow is held sacred to her. These two gods, they hold, regulate the entire universe, giving both nourishment and increase to p41all things by means of a system of three seasons which complete the full cycle through an unobservable movement, these being spring and summer and winter; and these seasons, though in nature most opposed to one another, complete the cycle of the year in the fullest harmony. Moreover, practically all the physical matter which is essential to the generation of all things is furnished by these gods, the sun contributing the fiery element and the spirit, the moon the wet and the dry, and both together the air; and it is through these elements that all things are engendered and nourished. 6 And so it is out of the sun and moon that the whole physical body of the universe is made complete; and as for the five parts just named of these bodies — the spirit, the fire, the dry, as well as the wet, and, lastly, the air-like — just as in the case of a man we enumerate head and hands and feet and the other parts, so in the same way the body of the universe is composed in its entirety of these parts. The father of men and of gods. Earth the Mother of all, Demeter giver of wealth. Oceanus source of gods and mother Tethys. For the Egyptians consider Oceanus to be their river Nile, on which also their gods were born; since, they say, Egypt is the only country in the whole inhabited world where there are many cities which were founded by the first gods, such as Zeus, Helius, Hermes, Apollo, Pan, Eileithyia, and many more. The air, they say, they called Athena, as the name is translated, and they considered her to be the daughter of Zeus and conceived of her as a virgin, because of fact that the air is by its nature uncorrupted and occupies the highest part of the entire universe; for the latter reason also the myth arose that she was born from the head of Zeus. Another name given her was Tritogeneia (Thrice-born), because her nature changes three times in the course of the year, in the spring, summer, and winter. They add that she is also called Glaucopis (Blue-eyed), not because she has blue eyes, as some Greeks have held — a silly explanation, indeed — but because the air has a bluish cast. Observing their insolence and lawful ways. Now so far as the celestial gods are concerned whose genesis is from eternity, this is the account given by the Egyptians. And besides these there are other gods, they say, who were terrestrial, having once been mortals, but who, by reason of their sagacity and the good services which they rendered to all men, attained immortality, some of them having even been kings in Egypt. Their names, when translated, are in some cases the same as those of the celestial gods, while others have a distinct appellation, such as Helius, Cronus, and Rhea, and also the Zeus who is called Ammon by some, and besides these Hera and Hephaestus, also Hestia, and, finally, Hermes. Helius was the first king of the Egyptians, his name being the same as that of the heavenly star. Some of the priests, however, say that Hephaestus was their first king, since he was the discoverer of fire and received the rule because of this service to mankind; for once, when a tree on the mountains had been struck by lightning and the forest near by was ablaze, Hephaestus went up to it, for it was winter-time, and greatly enjoyed the heat; as the fire died down he kept adding fuel to it, and while keeping the fire going in this way he invited the rest of mankind to enjoy the advantage which came from it. Then Cronus became the ruler, and upon marrying his sister Rhea he begat Osiris and Isis, according to some writers of mythology, but, according to the majority, Zeus and Hera, whose high achievements gave them dominion over the entire universe. From these last were sprung five gods, one born on each of the five days which the Egyptians intercalate; the names of these children were Osiris and Isis, and also Typhon, Apollo, and Aphroditê; and Osiris when translated is Dionysus, and Isis is more similar to Demeter than to any other goddess; and after Osiris married Isis and succeeded to the kingship he did many things of service to the social life of man. Osiris was the first, they record, to make mankind give up cannibalism; for after Isis had discovered the fruit of both wheat and barley which grew wild over the land along with the other plants but was still unknown to man, and Osiris had also devised the cultivation of these fruits, all men were glad to change their food, both because of the pleasing nature of the newly-discovered grains and because it seemed to their advantage to refrain from their butchery of one another. As proof of the discovery of these fruits they offer the following ancient custom which they still observe: Even yet at harvest time the people make a dedication of the first heads of the grain to be cut, and standing beside the sheaf beat themselves and call upon Isis, by this act rendering honour to the goddess for the fruits which she discovered, at the season when she first did this. Moreover in some cities, during the Festival of Isis as well, stalks of wheat and barley are carried among the other objects in the procession, as a memorial of what the goddess so ingeniously discovered at the beginning. Isis also established laws, they say, in accordance with which the people regularly dispense justice to one another and are led to refrain through fear of punishment from illegal violence and insolence; and it is for this reason also that the early Greeks gave Demeter the name Thesmophorus, acknowledging in this way that she had first established their laws. Osiris, they say, founded in the Egyptian Thebaid a city with a hundred gates, which the men of his day named after his mother, though later generations called it Diospolis, and some named it Thebes. There is no agreement, however, as to when this city was founded, not only among the historians, but even among the priests of Egypt themselves; for many writers say that Thebes was not founded by Osiris, but many years later by a certain king of whom we shall give a detailed account in connection with his period. Osiris, they add, also built a temple to his parents, Zeus and Hera, which was famous both for its size and its costliness in general, and two golden chapels to Zeus, the larger one to him as god of heaven, the smaller one to him as former king and father of the Egyptians, in which rôle he is called by some Ammon. He also made golden chapels for the rest of the gods mentioned above, allotting honours to each of them and appointing priests to have charge over these. Special esteem at the court of Osiris and Isis was also accorded to those who should invent any of the arts or devise any useful process; consequently, since copper and gold mines had been discovered in the Thebaid, they fashioned implements with which they killed the wild beasts and worked the soil, and thus in eager rivalry brought the country under cultivation, and they made images of the gods and magnificent golden chapels for their worship. And the discovery of the vine, they say, was made by him near Nysa, and that, having further devised the proper treatment of its fruit, he was the first to drink wine and taught mankind at large the culture of the vine and the use of wine, as well as the way to harvest the grape and to store wine. 9 The one most highly honoured by him was Hermes, who was endowed with unusual ingenuity for devising things capable of improving the social life of man. It was by Hermes, for instance, according to them, that the common language of mankind was first further articulated, and that many objects which were still nameless received an appellation, that the alphabet was invented, and that ordinances regarding the honours and offerings due to the gods were duly established; he was the first also to observe the orderly arrangement of the stars and the harmony of the musical sounds and their nature, to establish a wrestling school, and to give thought to the rhythmical movement of the human body and its proper development. He also made a lyre and gave it three strings, imitating the seasons of the year; for he adopted three tones, a high, a low, and a medium; the high from the summer, the low from the winter, and the medium from the spring. The Greeks also were taught by him how to expound (hermeneia) their thoughts, and it was for this reason p55that he was given the name Hermes. In a word, Osiris, taking him for his priestly scribe, communicated with him on every matter and used his counsel above that of all others. The olive tree also, they claim, was his discovery, not Athena's, as the Greeks say. Of Osiris they say that, being of a beneficent turn of mind, and eager for glory, he gathered together a great army, with the intention of visiting all the inhabited earth and teaching the race of men how to cultivate the vine and sow wheat and barley; for he supposed that if he made men give up their savagery and adopt a gentle manner of life he would receive immortal honours because of the magnitude of his benefactions. And this did in fact take place, since not only the men of his time who received his gift, but all succeeding generations as well, because of the delight which they take in the foods which were discovered, have honoured those who introduced them as gods most illustrious. Now after Osiris had established the affairs of Egypt and turned the supreme power over to Isis his wife, they say that he placed Hermes at her side as counsellor because his prudence raised him above the king's other friends, and as general of all the land under his sway he left Heracles, who was both his kinsman and renowned for his valour and physical strength, while as governors he appointed Busiris over those parts of Egypt which lie towards Phoenicia and border upon the sea and Antaeus over those adjoining Ethiopia and Libya; then he himself left Egypt with his army to make his campaign, taking in his company also his brother, whom the Greeks call Apollo. And it was Apollo, they say, who discovered the laurel, a garland of which all men place about the head of this god above all others. The discovery of ivy is also attributed to Osiris by the Egyptians and made sacred to this god, just as the Greeks also do in the case of Dionysus. And in the Egyptian language, they say, the ivy is called the "plant of Osiris" and for purposes of dedication is preferred to the vine, since the latter sheds its leaves while the former ever remains green; the same rule, moreover, the ancients have followed in the case of other plants also which are perennially green, ascribing, for instance, the myrtle to Aphroditê and the laurel to Apollo. Now Osiris was accompanied on his campaign, as the Egyptian account goes, by his two sons Anubis and Macedon, who were distinguished for their valour. Both of them carried the most notable accoutrements of war, taken from certain animals whose character was not unlike the boldness of the men, Anubis wearing a dog's skin and Macedon the fore-parts of a wolf; and it is for this reason that these animals are held in honour among the Egyptians. He also took Pan along on his campaign, who is held in special honour by the Egyptians; for the inhabitants of the land have not only set up statues of him at every temple but have also named a city after him in the Thebaid, called by the natives Chemmo, which when translated means City of Pan. In his company were also men who were experienced in agriculture, such as Maron in the cultivation of the vine, and Triptolemus in the sowing of grain and in every step in the harvesting of it. And when all his preparations had been completed Osiris made a vow to the gods that he would let his hair grow until his return to Egypt and then made his way through Ethiopia; and this is the reason why this custom with regard to their hair was observed among the Egyptians until recent times, and why those who journeyed abroad let their hair grow until their return home. 4 While he was in Ethiopia, their account continues, the Satyr people were brought to him, who, they say, have hair upon their loins. For Osiris was laughter-loving and fond of music and the dance; consequently he took with him a multitude of musicians, among whom were nine maidens who could sing and were trained in the other arts, these maidens being those who among the Greeks are called the Muses; and their leader (hegetes), as the account goes, was Apollo, who was for that reason also given the name Musegetes. As for the Satyrs, they were taken along in the campaign because they were proficient in dancing and singing and every kind of relaxation and pastime; for Osiris was not warlike, nor did he have to organize pitched battles or engagements, since every people received him as a god because of his benefactions. In Ethiopia he instructed the inhabitants in agriculture and founded some notable cities, and then left behind him men to govern the country and collect the tribute. On the river Aegyptus my curvéd ships I stayed. For it is at Thonis, as it is called, which in early times was the trading-port of Egypt, that the river empties into the sea. Its last name and that which the river now bears it received from the former king Nileus. Now when Osiris arrived at the borders of Ethiopia, he curbed the river by dykes on both banks, so that p63at flood-time it might not form stagnant pools over the land to its detriment, but that the flood-water might be let upon the countryside, in a gentle flow as it might be needed, through gates which he had built. After this he continued his march through Arabia along the shore of the Red Sea as far as India and the limits of the inhabited world. He also founded not a few cities in India, one of which he named Nysa, wishing to leave there a memorial of that city in Egypt where he had been reared. He also planted ivy in the Indian Nysa, and throughout India and those countries which border upon it the plant to this day is still to be found only in this region. And many other signs of his stay he left in that country, which have led the Indians of a later time to lay claim to the god and say that he was by birth a native of India. Osiris also took an interest in hunting elephants, and everywhere left behind him inscribed pillars telling of his campaign. And he visited all the other nations of Asia as well and crossed into Europe at the Hellespont. In Thrace he slew Lycurgus, the king of the barbarians, who opposed his undertaking, and Maron, who was now old, he left there to supervise the culture of the plants which he introduced into that land and caused him to found a city to bear his name, which he called Maroneia. Macedon his son, moreover, he left as king of Macedonia, which was named after him, while to Triptolemus he assigned the care of agriculture in Attica. Finally, Osiris in this way visited all the inhabited world and p65advanced community life by the introduction of the fruits which are most easily cultivated. And if any country did not admit of the growing of vine he introduced the drink prepared from barley, which is little inferior to wine in aroma and strength. On his return to Egypt he brought with him the very greatest presents from every quarter and by reason of the magnitude of his benefactions received the gift of immortality with the approval of all men and honour equal to that offered to the gods of heaven. After this he passed from the midst of men into the company of the gods and received from Isis and Hermes sacrifices and every other highest honour. These also instituted rites for him and introduced many things of a mystic nature, magnifying in this way the power of the god. Although the priests of Osiris had from the earliest times received the account of his death as a matter not to be divulged, in the course of years it came about that through some of their number this hidden knowledge was published to the many. This is the story as they give it: When Osiris was ruling over Egypt as its lawful king, he was murdered by his brother Typhon, a violent and impious man; Typhon then divided the body of the slain man into twenty-six pieces and gave one portion to each of the band of murderers, since he wanted all of them to share in the pollution and felt that in this way he would have in them steadfast supporters and defenders of his rule. But Isis, the sister and wife of Osiris, avenged his murder with the aid of her son Horus, and after slaying Typhon and his accomplices became queen over Egypt. The struggle between them took place on the banks of the Nile near the village now known as Antaeus, which, they say, lies on the Arabian side of the river and derives its name from that ofº Antaeus, a contemporary of Osiris, who was punished by Heracles. Now Isis recovered all the pieces of the body except the privates, and wishing that the burial-place of her husband should remain secret and yet be honoured by all the inhabitants of Egypt, she fulfilled her purpose in somewhat the following manner. Over each piece of the body, as the account goes, she fashioned out of spices and wax a human figure about the size of Osiris; then summoning the priests group by group, she required all of them an oath that they would reveal to no one the trust which she was going to confide to them, and taking each group of them apart privately she said that she was consigning to them alone the burial of the body, and after reminding them of the benefactions of Osiris she exhorted them to bury his body in their own district and pay honours to him as to a god, and to consecrate to him also some one that they might choose of the animals native to their district, pay it while living the honours which they had formerly rendered to Osiris, and upon its death accord it the same kind of funeral as they had given to him. And since Isis wished to induce the priests to render these honours by the incentive of their own profit also, she gave them the third part of the country to defray the cost of the worship and service of the gods. And the priests, it is said, being mindful of the benefactions of Osiris and eager to please the queen p69who was petitioning them, and incited as well by their own profit, did everything just as Isis had suggested. It is for this reason that even to this day each group of priests supposes that Osiris lies buried in their district, pays honours to the animals which were originally consecrated to him, and, when these die, renews in the funeral rites for them the mourning for Osiris. The consecration to Osiris, however, of the sacred bulls, which are given the names Apis and Mnevis, and worship of them as gods were introduced generally among all the Egyptians, since these animals had, more than any others, rendered aid to those who discovered the fruit of the grain, in connection with both the sowing of the seed and with every agricultural labour from which mankind profits. Isis, they say, after the death of Osiris took a vow never to marry another man, and passed the remainder of her life reigning over the land with complete respect for the law and surpassing all sovereigns in benefactions to her subjects. And like her husband she also, when she passed from among men, received immortal honours and was buried near Memphis, where her shrine is pointed out to this day in the temple-area of Hephaestus. According to some writers, however, the bodies of these two gods rest, not in Memphis, but on the border between Egypt and Ethiopia, on the island in the Nile which lies near the city which is called Philae, but is referred to because of this burial as the Holy Field. In proof of this they point to remains which still survive on this island, both to the tomb constructed for Osiris, which is honoured in common by all the priests of Egypt, and to the three hundred and sixty libation bowls which are placed around it; for the priests appointed over these bowls fill them each day with milk, singing all the while a dirge in which they call upon the names of these gods. It is for this reason that travellers are not allowed to set foot on this island. And all the inhabitants of the Thebaid, which is the oldest portion of Egypt, hold it to be the strongest oath when a man swears "by Osiris who lieth in Philae." Now the parts of the body of Osiris which were found were honoured with burial, they say, in the manner described above, but the privates, according to them, were thrown by Typhon into the Nile because no one of his accomplices was willing to take them. Yet Isis thought them as worthy of divine honours as the other parts, for, fashioning a likeness of them, she set it up in the temples, commanded that it be honoured, and made it the object of the highest regard and reverence in the rites and sacrifices accorded to the god. Consequently the Greeks too, inasmuch as they received from Egypt the celebrations of the orgies and the festivals connected with Dionysus, honour this member in both the mysteries and the initiatory rites and sacrifices of this god, giving it the name "phallus." The number of years from Osiris and Isis, they say, to the reign of Alexander, who founded the city which bears his name in Egypt, is over ten thousand, but, according to other writers, a little less than twenty-three thousand. 2 And those who say that the god was born of Semelê and Zeus in Boeotian Thebes are, according to the priests, simply inventing the tale. For they say that Orpheus, upon visiting Egypt and participating in the initiation and mysteries of Dionysus, adopted them and as a favour to the descendants of Cadmus, since he was kindly disposed to them and received honours at their hands, transferred the birth of the god to Thebes; and the common people, partly out of ignorance and partly out of their desire to have the god thought to be a Greek, eagerly accepted his initiatory rites and mysteries. What led Orpheus to transfer the birth and rites of the god, they say, was something like this. Cadmus, who was a citizen of Egyptian Thebes, begat several children, of whom one was Semelê; she was violated by an unknown person, became pregnant, and after seven months gave birth to a child whose appearance was such as the Egyptians hold had been that of Osiris. Now such a child is not usually brought into the world alive, either because it is contrary to the will of the gods or because the law of nature does not admit of it. But when Cadmus found out what had taken place, having at the same time a reply from an oracle commanding him to observe the laws of his fathers, he both gilded the infant and paid it the appropriate sacrifices, on the ground that there had been a sort of epiphany of Osiris among men. The fatherhood of the child he attributed to Zeus, in this way magnifying Osiris and averting slander from his violated daughter; and this is the reason why the tale was given out among the Greeks to the effect that Semelê, the daughter of Cadmus, was the mother of Osiris by Zeus. Now at a later time Orpheus, who was held in high regard among the Greeks for his singing, initiatory rites, and instructions on things divine, was entertained as a guest by the descendants of Cadmus and accorded unusual honours in Thebes. And since he had become conversant with the teachings of the Egyptians about the gods, he transferred the birth of the ancient Osiris to more recent times, and, out of regard for the descendants of Cadmus, instituted a new initiation, in the ritual of which the initiates were given the account that Dionysus had been born of Semelê and Zeus. And the people observed these initiatory rites, partly because they were deceived through their ignorance, partly because they were attracted to them by the trustworthiness of Orpheus and his reputation in such matters, and most of all because they were glad to receive the god as a Greek, which, as has been said, is what he was considered to be. 8 Later, after the writers of myths and poets had taken over this account of his ancestry, the theatres became filled with it and among following generations faith in the story grew stubborn and immutable. In general, they say, the Greeks appropriate to themselves the most renowned of both Egyptian heroes and gods, and so also the colonies sent out by them. Heracles, for instance, was by birth an Egyptian, who by virtue of his manly vigour visited a large part of the inhabited world and set up his pillar in Libya; and their proofs of this assertion they endeavour to draw from the Greeks themselves. For inasmuch as it is generally accepted that Heracles fought on the side of the Olympian gods in their war against the Giants, they say that it in no way accords with the age of the earth for the Giants to have been born in the period when, as the Greeks, Heracles lived, which was a generation before the Trojan War, but rather at the time, as their own account gives it, when mankind first appeared on the earth; for from the latter time to the present the Egyptians reckon more than ten thousand years, but from the Trojan War less than twelve hundred. Likewise, both the club and the lion's skin are appropriate to their ancient Heracles, because in those days arms had not yet been invented, and men defended themselves against their enemies with clubs of wood and used the hides of animals for defensive armour. They also designate him as the son of Zeus, but about the identity of his mother they say that they know nothing. 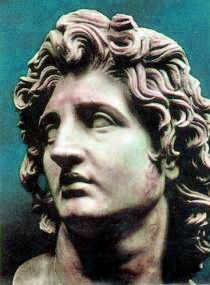 The son of Alcmenê, who was born more than ten thousand years later and was called Alcaeus at birth, in later life became known instead as Heracles, not because he gained glory (kleos) by the aid of Hera, as Matris says, but because, having avowed the same principles as the ancient Heracles, he inherited that one's fame and name as well. The account of the Egyptians agrees also with the tradition which has been handed down among the Greeks since very early times, to the effect that Heracles cleared the earth of wild beasts, a story which is in no way suitable for man who lived in approximately the period of the Trojan War, when most parts of the inhabited world had already been reclaimed from their wild state by agriculture and cities and the multitude of men settled everywhere over the land. Accordingly this reclamation of the land suits better a man who lived in early times, when men were still held in subjection by the vast numbers of wild beasts, a state of affairs which was especially true in the case of Egypt, the upper part of which is to this day desert and infested with wild beasts. Indeed it is reasonable to suppose that the first concern of Heracles was for this country as his birthplace, and that, after he had cleared the land of wild beasts, he presented it to the peasants, and for this benefaction was accorded divine honours. And they say that Perseus also was born in Egypt, and that the origin of Isis is transferred by the Greeks to Argos in the myth which tells of that Io who was changed into a heifer. In general, there is great disagreement over these gods. For the same goddess is called by some Isis, by others Demeter, by others Thesmophorus, by others Selenê, by others Hera, while still others apply to her all these names. Osiris has been given the name Sarapis by some, Dionysus by others, Pluto by others, Ammon by others, Zeus by some, and many have considered Pan to be the same god; and some say that Sarapis is the god whom the Greeks call Pluto. 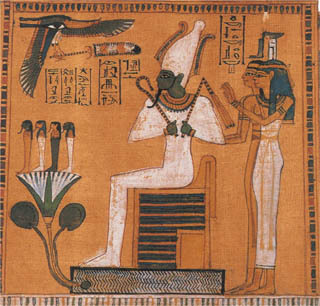 As for Isis, the Egyptians say that she was the discoverer of many health-giving drugs and was greatly versed in the science of healing; consequently, now that she has attained immortality, she finds her greatest delight in the healing of mankind and gives aid in their sleep to those who call upon her, plainly manifesting both her very presence and her beneficence towards men who ask her help. In proof of this, as they say, they advance not legends, as the Greeks do, but manifest facts; for practically the entire inhabited world is their witness, in that it eagerly contributes to the honours of Isis because she manifests herself in healings. For standing above the sick in their sleep she gives them aid for their diseases and works remarkable cures upon such as submit themselves to her; and many who have been despaired of by their physicians because of the difficult nature of their malady are restored to health by her, while numbers who have altogether lost the use of their eyes or of some other part of their body, whenever they turn for help to this goddess, are restored to their previous condition. Furthermore, she discovered also the drug which gives immortality, by means of which she not only raised from the dead her son Horus, who had been the object of plots on the part of Titans and had been found dead under the water, giving him his p83soul again, but also made him immortal. And it appears that Horus was the last of the gods to be king after his father Osiris departed from among men. Moreover, they say that the name Horus, when translated, is Apollo, and that, having been instructed by his mother Isis in both medicine and divination, he is now a benefactor of the race of men through his oracular responses and his healings. The priests of the Egyptians, reckoning the time from the reign of Helius to the crossing of Alexander into Asia, say that it was in round numbers twenty-three thousand years. And, as their legends say, the most ancient of the gods ruled more than twelve hundred years and the later ones not less than three hundred. But since this great number of years surpasses belief, some men would maintain that in early times, before the movement of the sun had as yet been recognized, it was customary to reckon the year by the lunar cycle. Consequently, since the year consisted of thirty days, it was not impossible that some men lived twelve hundred years; for in our own time, when our year consists of twelve months, not a few men live over one hundred years. A similar explanation they also give regarding those who are supposed to have reigned for three hundred years; for at their time, namely, the year was composed of the four months which comprise the seasons of each year, that is, spring, summer, and winter; and it is for this reason that among some of the Greeks the years are called p85"seasons" (horoi) and that their yearly records are given the name "horographs." Furthermore, the Egyptians relate in their myths that in the time of Isis there were certain creatures of many bodies, who are called by the Greeks Giants, but by themselves . . ., these being the men who are represented on their temples in monstrous form and as being cudgelled by Osiris. Now some say that they were born of the earth at the time when the genesis of living things from the earth was still recent, while some hold that they were only men of unusual physical strength who achieved many deeds and for this reason were described in the myths as of many bodies. But it is generally agreed that when they stirred up war against Zeus and Osiris they were all destroyed. The Egyptians also made a law, they say, contrary to the general custom of mankind, permitting men to marry their sisters, this being due to the success attained by Isis in this respect; for she had married her brother Osiris, and upon his death, having taken a vow never to marry another man, she both avenged the murder of her husband and reigned all her days over the land with complete respect for the laws, and, in a word, became the cause of more and greater blessings to all men than any other. It is for these reasons, information, that it was ordained that the queen should have greater power and honour than the king and that among private persons the wife should enjoy authority over her husband, the husbands agreeing in the marriage contract that they will be obedient in all things to their wives. Now I am not unaware that some historians give the following account of Isis and Osiris: The tombs of these gods lie in Nysa in Arabia, and for this reason Dionysus is also called Nysaeus. And in that place there stands also a stele of each of the gods bearing an inscription in hieroglyphs. On the stele of Isis it runs: "I am Isis, the queen of every land, she who was instructed of Hermes, and whatsoever laws I have established, these can no man make void. I am the eldest daughter of the youngest god Cronus; I am the wife and sister of the king Osiris; I am she who first discovered fruits for mankind; I am the mother of Horus the king; I am she who riseth in the star that is in the Constellation of the Dog; by me was the city of Bubastus built. Farewell, farewell, O Egypt that nurtured me." And on the stele of Osiris the inscription is said to run: "My father is Cronus, the youngest of all the gods, and I am Osiris the king, who campaigned over every country as far as the uninhabited regions of India and the lands to the north, even to the sources of the river Ister, and again to the remaining parts of the world as far as Oceanus. I am the eldest son of Cronus, and being sprung from a fair and noble egg I was begotten a seed of kindred birth to Day. There is no region of the inhabited world to which I have not come, dispensing to all men the things of which I was the discoverer." So much of the inscriptions on the stelae can be read, they say, but the rest of the writing, which was of greater extent, has been destroyed by time. However this may be, varying accounts of the burial of these gods are found in most writers by reason of the fact that the priests, having received the exact facts about these matters as a secret not to be divulged, are unwilling to give out the truth to the public, on the ground that perils overhang any men who disclose to the common crowd the secret knowledge about these gods. Now the Egyptians say that also after these events a great number of colonies were spread from Egypt over all the inhabited world. To Babylon, for instance, colonists were led by Belus, who was held to be the son of Poseidon and Libya; and after establishing himself on the Euphrates river he appointed priests, called Chaldaeans by the Babylonians, who were exempt from taxation and free from every kind of service to the state, as are the priests of Egypt; and they also make observations of the stars, following the example of the Egyptian priests, physicists, and astrologers. They say also that those who set forth with Danaus, likewise from Egypt, settled what is practically the oldest city in Greece, Argos, and that the nation of the Colchi in Pontus and that of the Jews, which lies between Arabia and Syria, were founded as colonies by certain emigrants from their country; and this is the reason why it is a long-established institution among these two peoples to circumcise their male children, the custom having been brought over from Egypt. Even the Athenians, they say, are colonists from Saïs in Egypt, and they undertake to offer proofs of such a relationship; for the Athenians are the only Greeks who call their city "Asty," a name brought over from the city Asty in Egypt. Furthermore, their body politic had the same classification and division of the people as found in Egypt, where the citizens have been divided into three orders: the first Athenian class consisted of the "eupatrids," as they were called, being those who were such as had received the best education and were held worthy of the highest honour, as is the case with the priests of Egypt; the second was that of the "geomoroi," who were expected to possess arms and to serve in defence of the state, like those in Egypt who are known as husbandmen and supply the warriors; and the last class was reckoned to be that of the "demiurgoi," who practise the mechanical arts and render only the most menial services to the state, this class among the Egyptians having a similar function. Moreover, certain of the rulers of Athens were originally Egyptians, they say. Petes, for instance, the father of that Menestheus who took part in the expedition against Troy, having clearly been an Egyptian, later obtained citizenship at Athens and the kingship. . . . 7 He was of double form, and yet the Athenians are unable from their own point of view to give the true explanation of this nature of his, although it is patent to all that it was because of his double citizenship, Greek and barbarian, that he was held to be of double form, that is, part animal and part man. In the same way, they continue, Erechtheus also, who was by birth an Egyptian, became king of Athens, and in proof of this they offer the following considerations. Once when there was a great drought, as is generally agreed, which extended over practically all the inhabited earth except Egypt because of the peculiar character of that country, and there followed a destruction both of crops and of men in great numbers, Erechtheus, through his racial connection with Egypt, brought from there to Athens a great supply of grain, and in return those who had enjoyed this aid made their benefactor king. After he had secured the throne he instituted the initiatory rites of Demeter in Eleusis and established the mysteries, transferring their ritual from Egypt. And the tradition that an advent of the goddess into Attica also took place at that time is reasonable, since it was then that the fruits which are named after her were brought to Athens, and this is why it was thought that the discovery of the seed had been made again, as though Demeter had bestowed the gift. And the Athenians on their part agree that it was in the reign of Erechtheus, when a lack of rain had wiped out the crops, that Demeter came to them with the gift of grain. Furthermore, the initiatory rites and mysteries of this goddess were instituted at Eleusis at that time. And their sacrifices as well as their ancient ceremonies are observed by the Athenians in the same way as by the Egyptians; for the Eumolpidae were derived from the priests of Egypt and the Ceryces from the pastophoroi. They are also the only Greeks who swear by Isis, and they closely resemble the Egyptians in both their appearance and manners. By many other statements like these, spoken more out of a love for glory than with regard for the truth, as I see the matter, they claim Athens as a colony of theirs because of the fame of that city. In general, the Egyptians say that their ancestors sent forth numerous colonies to many parts of the inhabited world, the pre-eminence of their former kings and their excessive population; but since they offer no precise proof whatsoever for these statements, and since no historian worthy of credence testifies in their support, we have not thought that their accounts merited recording. So far as the ideas of the Egyptians about the gods are concerned, let what we have said suffice, since we are aiming at due proportion in our account, but with regard to the land, the Nile, and everything else worth hearing about we shall endeavour, in each case, to give the several facts in summary.